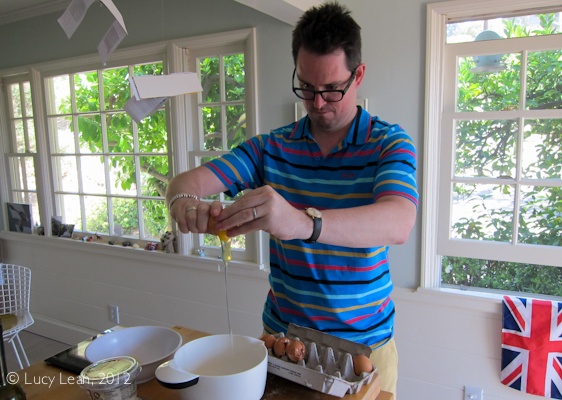 I didn’t set out to make pommes dauphinois on Saturday – far from it I was in the kitchen with Rémy making microwave potato chips for our Bastille Day dinner. However, is there anything more French and more delicious than pommes dauphinois? Just the smell of the layers of potatoes cooking in garlic infused cream with a genrous sprinkling of Gruyere on top is enough to get the saliva glands working overtime. I prefer to break a golden French rule and top my gratin with cheese – a true dauphinois is just the potatoes and cream baked. 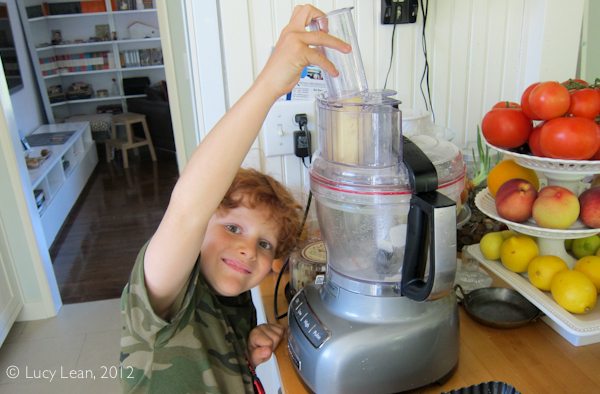 I had figured out how to use the slicer on my Kitchen Aid Food Processor when Rémy, a lover of all things mechanical, asked to help. I’m not surprised given that as the blade whizzes around the peeled potato disappears down the shoot et voila – a stack of perfectly sliced potatoes are left. I took a moment to explain to him the dangers and what to do to keep his little fingers safe and off he went. 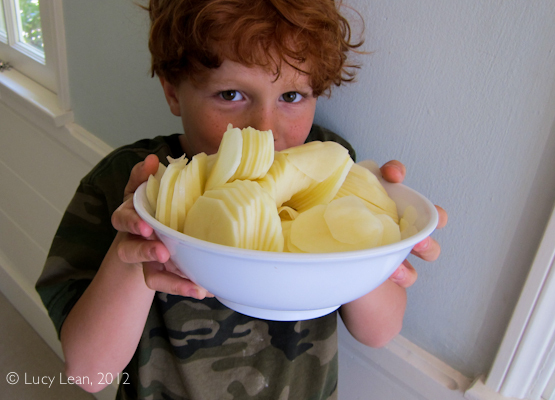 He got a little carried away and the next thing I know he’s sliced six potatoes. We soaked the slices in water and patted them dry, laid them out on kitchen towel on a dinner plate and placed them in the microwave on high for 3 minutes. We turned the potatoes over and cooked them for a further 3 minutes. Out came perfectly crispy potato chips – surprisingly crunchy and golden given that these were simply potato slices – no oil, no frying – nothing – 100% pure potato. Now to make up chips from one potato would have been doable – I guess there were about 10 slices on each plate – at 6 minutes – it would have taken hours to microwave all the slices. Plus, as fast as I microwaved, the chips would be eaten – with a sprinkling of salt – or then the fancy chips with herbs sandwiched between each slice that I experimented with. And then my friend Felix Salmon popped by for a visit. I’d realized from Twitter that he was in Los Angeles when he referenced the Silver Lake Farmers’ Market and tweeted if we were going to get a sighting. He bravely got in his cute cherry red VW Golf and drove himself up into the Hollywood Hills from Los Feliz and arrived at my door. It was so nice to see him and as I cooked we chatted and caught up on all the news – the global financial crisis, the smoker our mutual friend John had bought for them to smoke everything in Manhattan – smoked pigs cheeks anyone?, the Barclays resignation, pregnancy gossip, Marketplace and Kai Ryssdal, Felix had been a guest on the radio show the previous day and the upstate NY cottage Michelle and Felix now frequent every weekend. This last piece of news made me feel very old and grown-up. Plus how much of a Yuppie Felix is. I guess he and Michelle are technically DINKies. As the time moved on I made the crust for a tart au citron using Ludo’s Crave recipe and then the filling using Marco Pierre White’s recipe. Felix watched and kept banging on about how complicated baking was – rollling the crust out, dry baking it with pie weights, filling the hot pie with cold custard, knowing when the exact wobbly had been reached and it was ready – all skills and knowledge you had to bring to a recipe that wasn’t usually stated in the instructions. Felix is one of the brainiest people I know – seriously pedantic about all things being grammatically correct and boy will he let us know if it’s not. The only thing for it was to get Felix cooking. He was intrigued when I cracked eggs on the flat surface rather than the side of the bowl so I gave him 5 eggs to crack for the gougeres I was making. Apart from a rather large piece of shell I luckily caught and fished out he really made it look very easy. Just look at that concentration as he cracks open egg number 4. Tart au citron, gougeres, no chips and two large bowls of raw potato slices still sitting on the counter. 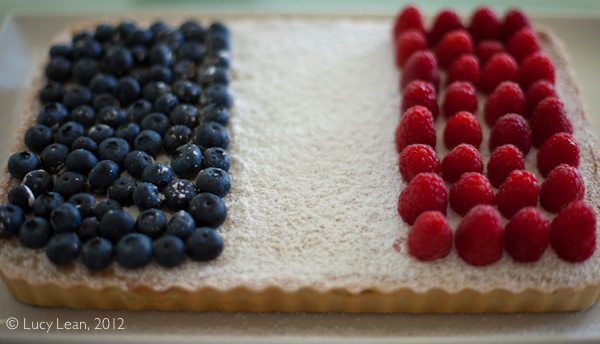 I knew I would never be able to microwave them all before my guests arrived to celebrate Bastille Day. “I’ll make an impromptu dauphinois!” I said. “Cream, fresh herbs, garlic, Comte cheese – and Rémy’s mountain of potato slices.” Felix cut up the garlic into tiny pieces as I searched the refrigerator for extra cream – luckily I had a tub of creme fraiche. 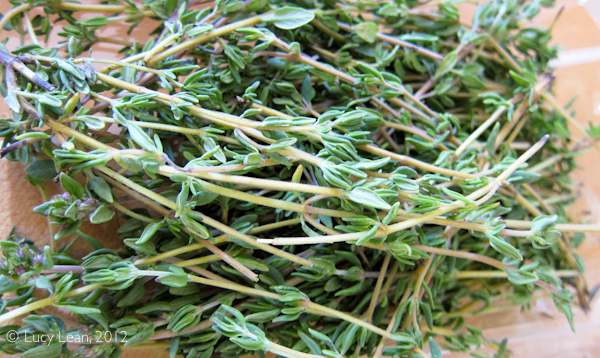 Fresh thyme and a little nutmeg was sprinkled on top. As the gougeres came out of the oven the daupinois went in. I wish I had snapped a picture of the finished dish – all golden brown and bubbling and irresitable. But by that time, Felix had been summoned back to Los Feliz by Michelle who was baking coffee cookies and Krissy and Ludo had arrived with the twins and the pink champagne was flowing… and photographs for blog posts has drifted off into a Summer evening with friends. I had worried that dauphinois would be a little heavy for a summer gathering in the secret garden but as the temperature dropped with the setting sun and guests wrapped themselves in pashminas it was the perfect accompaniment to the grilled harrissa chicken and steaks marinated in Japanese whisky. Two large platters of salads, some fine French wine, friends from near and far and the dinner stretched out into the night, punctuated by second helpings of dauphinois (there was none left!) and then later the tarte au citron and more Champagne. Vive la France! 2. Butter a deep baking dish – I used my Le Crueset dish that’s 12″ x 9″. 3. In a small saucepan over low heat gentle simmer the cream and garlic. 4. Slice all the potatoes to about 1/8 inch thick using the slicer on the food-processor, a mandolin or even a sharp knife. Arrange the slices in the baking dish overlapping. Spoon over some of the cream and press down gently. Continue to arrange all the potatoes and add the cream. The liquid should be enough to be seen around the potatoes – add a little milk to make up the quatity if you are short. 5. Scatter the top with the nutmeg, herbs and salt and pepper followed by the grated cheese. 6. Bake in the center of the oven on a baking sheet for 45 minutes or until a knife goes easily through the potatoes. If the top of the gratin is getting too brown you can cover with aluminum foil and continue to bake until the slices are tender. 7. 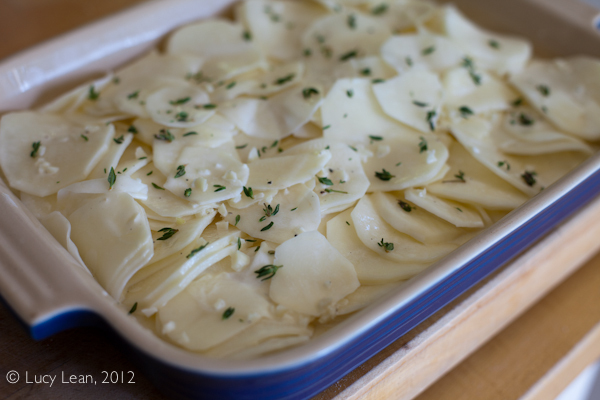 Turn off the oven and let the dauphinois rest for 10 minutes in the cooling oven before serving. What a nice dish for a celebration. Looks like you all had a great time! One of my all-time favorite potato preparations! 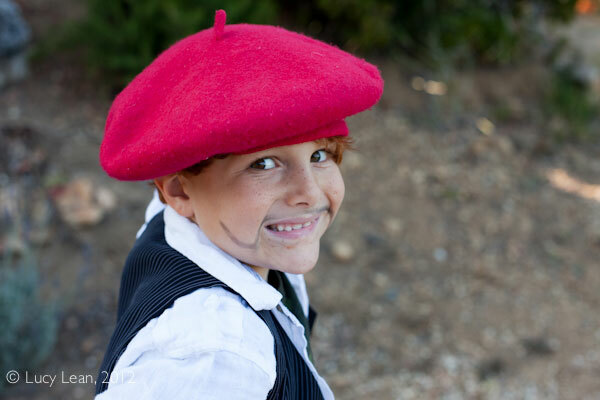 Your Bastille Day celebration looks like it was a blast! This looks delicious! 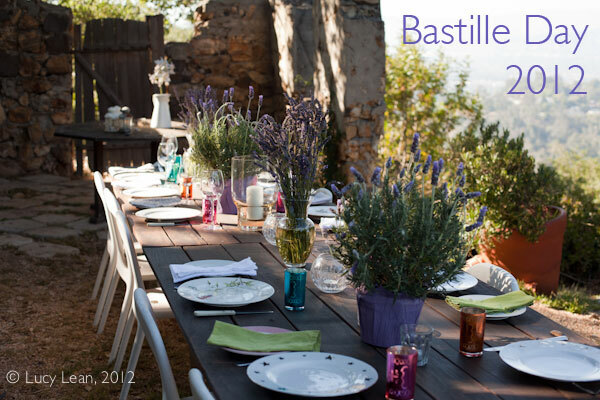 When my good college friend and I lived together, we would host a Bastille Day party every year. It was so fun! Looks like quite a festive day. 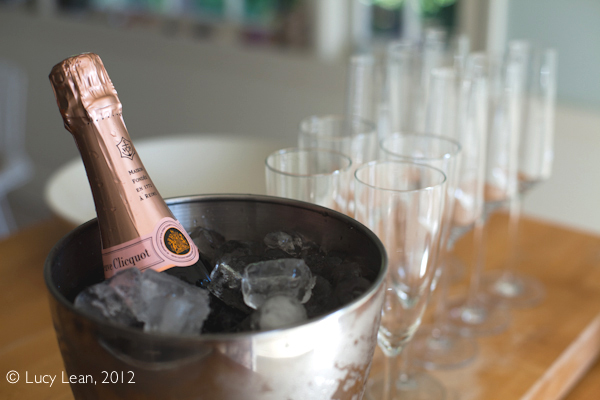 Thanks for the recipe and the glimpse into that fun party! one of my favorite dishes. looks like loads of fun!